Enjoy firing up the barbecue during the summer months? A British summer isn't complete without a barbecue. Before you start sizzling away take a look at our tips for staying safe whilst having fun with family and friends. 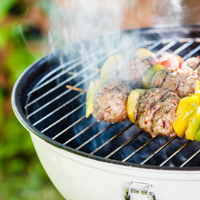 Make sure your barbecue is standing on a flat surface and away from fences, trees and sheds. Light your charcoal an hour before you commence cooking. Lighter fuels must only be applied before lighting. Never use petrol or paraffin to start or re-ignite your barbecue. Only use barbecue fire lighters or starter fuel on cold coals. Be careful with fatty foods and never poor oil onto meat when it is cooking. Try not to drink too much alcohol whilst cooking. Keep a bucket of water or a garden hose nearby. Don’t leave the barbecue unattended. Never use a barbecue indoors or in an enclosed space. A warm, smouldering barbecue gives of plenty of poisonous carbon monoxide. If used indoors or an enclosed space carbon monoxide can build up to dangerous levels very quickly. After you have finished cooking, extinguish the burning coals. Leave for a period of time and then check that the fire is completely out. Make sure the barbecue is cool before trying to move it. Never put hot ashes straight into a dustbin or wheelie bin. They could melt the plastic and cause a fire. Make sure the tap is off before changing the gas cylinder and do it in the open air. Read the manufacturer’s instructions on how to check for leaks in the cylinder or pipework. Don’t keep more cylinders than you need. Gas cylinders should be kept outside. Away from direct sunlight and frost. Change cylinders outdoors if possible or in a well-ventilated area.